My children and their new best friend. Many people enter the paranormal field because of childhood experiences they can’t explain. Maybe they had a nightly visitor that would stand at the end of their bed or maybe their imaginary playmate wasn’t so… imagined. Those people come to us and other paranormal groups needing to answer the questions of their youth, to verify that what they saw and experienced was real. I’m not one of those people. My childhood was a quiet one, spent on the banks of the Kanawha River in West Virginia. Visitors from the other side may not have hovered near me, but I did live in the state made famous for its paranormal shenanigans. It’s the state where a group of people claimed to come in contact with an alien creature back in 1952. It’s the state where testimony from a ghost was used in a murder trial. And it’s the home of The Mothman. In a sleepy little West Virginia town, on the banks of the Kanawha and Ohio rivers, the legend of the Mothman was born. Fifty years ago, the town of Point Pleasant was terrified by sightings of a strange creature. Over seven feet tall, it was covered in a gray fur, gigantic wings, and had red, glowing eyes. It was sighted throughout Point Pleasant, as far east as Clendenin, and frightened the townsfolk for 13 months, from November, 1966, until the collapse of the Silver Bridge on December 15, 1967. 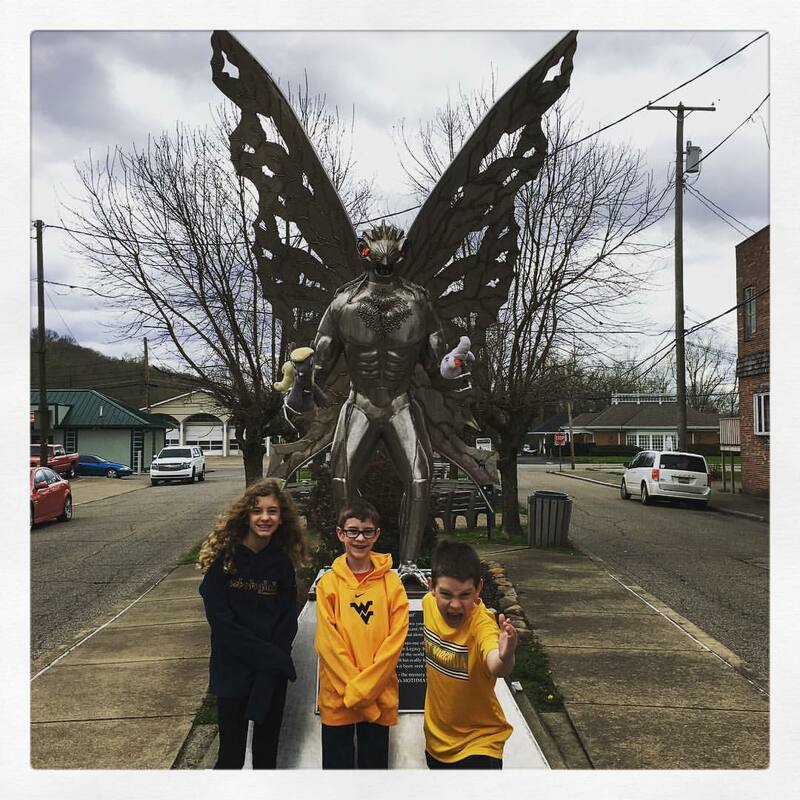 For my kids’ Spring Break, I packed them up and drove them north to West Virginia so that they could see where I grew up and understand why I love my home state so much. One of our stops was, of course, Point Pleasant and the Mothman Museum. My childhood, though free of ghosts and shadow figures, was filled with books and daydreams. I first read The Mothman Prophecies, by John Keel, when I was a little girl. I was disgusted by the bland selection of books in the children’s section at my local library and decided one day to delve into the variety of the adult non-fiction books. One day, I took the plunge and walked across the great expanse between those two sections and found a book that scared the bejeezus out of me. It had a cream dust jacket and on the front was a crude drawing of a winged creature with bright red eyes. I was hooked. After reading John Keel’s interpretation of the Point Pleasant Mothman and UFO sightings, as well as visitations from strange men in black, I couldn’t get enough. I read every book about paranormal phenomena I could find, discussing ideas with my father, a fellow paranormal enthusiast from way back. My interest in the paranormal started not in the dark recesses of my home, but in the bright, sunny bookshelves of the South Charleston Public Library. When I planned our recent Spring Break trip, I knew I had to face one of those monsters of my youth and introduce him to my children. 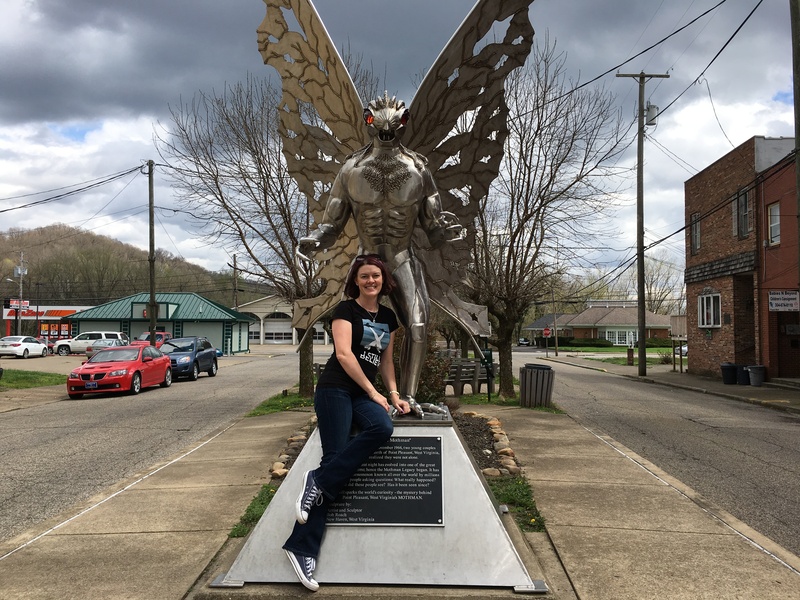 We drove from our hotel in South Charleston and arrived in Point Pleasant to the sight of the Mothman statue just off Main Street. I had seen the picture of the statue many times and we immediately posed for pictures. We then headed into the Mothman Museum and enjoyed the displays of pictures, videos, and original newspaper clippings of articles written by Mary Hyre of The Athens Messenger. I was enthralled. The kids, though more interested in buying t-shirts and tchotchkes from the store, had a great time. As we left Point Pleasant, we crossed over the Silver Memorial Bridge into Gallipolis, Ohio. The original Silver Bridge collapsed in December, 1967, killing 46 people. The Mothman, seen for 13 months prior and reportedly witnessed on the trusses of the bridge just before its collapse, disappeared. Was he there to warn the people of Point Pleasant about the bridge collapse, to function as a harbinger? Who knows. 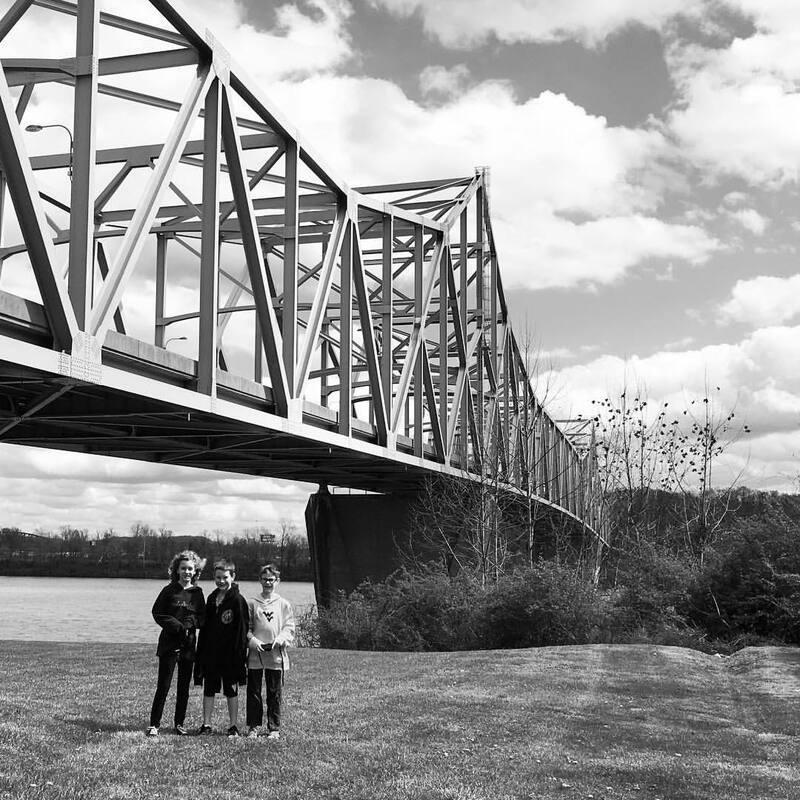 My three children, though, gamely posed on the Ohio side of the Ohio River, under the Silver Memorial Bridge, and expressed their excitement over being able to cross another state off their list. I, meanwhile, hoped that a dark grey figure with bulging red eyes would show up in an epic photobomb. I, of course, was disappointed. I guess the point I’m trying to make here is that adulthood is many things. It’s responsibilities and acceptance mixed in with facing our childhood fears and memories, both bad and good. John Keel and the Mothman kept me awake many nights, convinced that those glowing red eyes were just outside my window. But now, he’s an old friend and the reason why I seek out the paranormal, excitedly hoping for the next unexplainable experience. If the Mothman showed up in the skies over Woodstock, Georgia, I wouldn’t run and hide. I would, instead, welcome him as an old friend. And avoid all local bridges for the foreseeable future. This entry was posted in cryptozoology and tagged Atlanta ghost hunters, Atlanta paranormal investigators, Georgia ghost hunters, Georgia paranormal investigators, ghosts, North Georgia ghost hunters, North Georgia paranormal investigators, paranormal, paranormal georgia, Paranormal Georgia Investigations, paranormal investigators, PGI. Bookmark the permalink. As yourself I had an interest in the paranormal for most of my life. Good article.